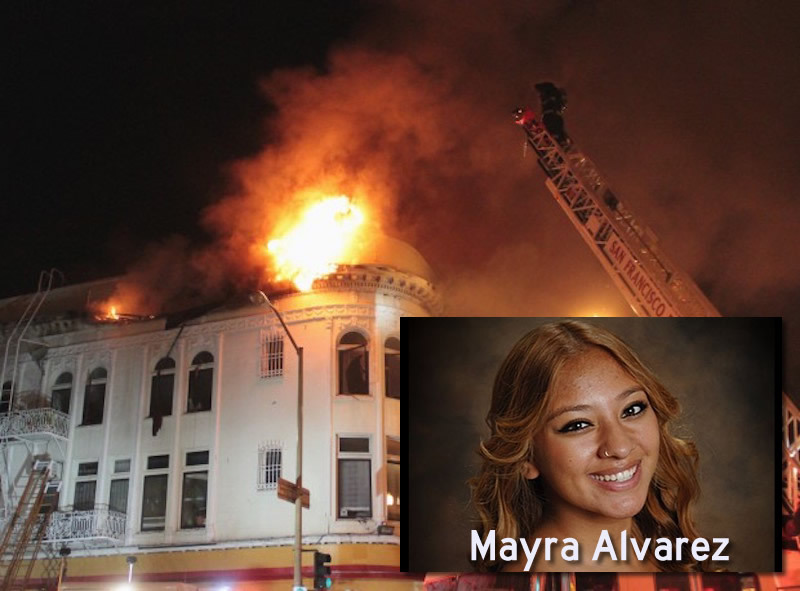 The massive fire that destroyed the Mission Market building on the corner of Mission and 22nd Street on January 28 was a tragedy on so many levels — one fatality, 40+ residents lost their homes, businesses destroyed, and a historic Mission building gone forever. We lived on Folsom between Eugenia & Powhattan, at 3658. Our neighbors, Betty & Paolo Alvarez, raised their family and grandchildren in the house next to us. Marcie is one of their children and Mayra & Alfonso are their grandchildren. They are a 30+ year Bernal family. Mayra was our babysitter and she is flat-out wonderful. She would often invite all the cousins over to our house to play and our kids loved it. Marcie, Mayra’s mom, is a single mom putting Alfonso and soon Mayra through college. They moved to the Mission about a year or so ago. Betty & Paolo have since moved, as well, because the cost of living became too much to bear. They are a very kind family. I am heartbroken for them, but so incredibly thankful that they were rescued by our firefighters. My name is Mayra Alvarez. I am 17 and currently a senior at Galileo high school. Like every other senior, I am currently in the process of applying to college, hoping to pursue a career in nursing. Nursing is my career choice because I love to help people in need and give back to my community. I have been surrounded by nurses all my life due to my asthma and kidney illness. The college process is very difficult, especially when there are obstacles along the way; such as this one. In the time of the fire, I was enjoying my dinner with my mother, as we began to smell the smoke. No yells or fire alarms were heard to warn us, just the black smoke burning our eyes and making it hard for me to breathe. I didn’t have many escape options, I was seconds away from jumping out the window, three floors up, as the fireman began to pull me out. Very little breathe, no inhaler, hope is all I had. I truly thought I would take my last breathe in apartment 316, my home, which is now gone for good. We are currently looking for a stable place to live, but need as much help as we could get. I live with my brother and my mother, a hard working single mother. My brother is currently enrolled in college, and this tragic event has truly affected us all. We have lost everything: clothes, shoes, food and savings. Just like every new start, it’s time to start from scratch. Oof. You can make a direct donation to help the Alvarez family right here. Otherwise, you can also contribute to a general fund for victims of the January 28 fire here. Finally, Miss Emmy from Emmy’s Spaghetti Shack on Mission Street in Bernal has also been in contact. She tells Bernalwood, “Please let our neighbors know we are collecting stuff for the fire victims this weeknd and forever how long.” The list of items the displaced families need is here; you can drop things off at Emmy’s, 3230 Mission Street (near Valencia). Hi. When I click on the link for the items needed for donation, it takes me to the crowd source fundraising page. I”m looking for the link for the items that Emmy’s is collecting, please. Thanks!! That is the correct link; please scroll down to read the list. Iam so sorry, let me try to help! My family will prayfor you all, and just maybe well try to gather donations. Sincerely, The Ruiz family.